I don't know what the weather is like where you live... but if I've said it once, I've said it a million times... I LOVE FALL! The weather gets cooler (not too cold) and the humidity is under control. I live in coastal Georgia and let me tell you, humidity is NO JOKE! Anyhow, cooler weather means, warmer foods... YUM!!! I had NEVER had squash soup before. Then, one afternoon, I decided to give it a taste test at lunch... I... FELL... IN... LOVE!!! I immediately started googling and was NOT getting very far. There are a TON of recipes out there. So, I went back to the lady that had made the soup and asked her. Here's the 'recipe' she gave me. The only thing is, there won't be any measurements because everything is about eyeballing and tasting things. Today's deal of the day is for a FREE upgrade!! You can choose rounded corners for F-R-E-E. Use code 1029DOD at checkout. Remember that it's ONLY good TODAY!! **Remember** that if you don't have the perfect picture yet, you can use the pre-ship service. You order your cards now and finish them with your picture later. PLUS, they'll send you your envelopes early so that you can start addressing them! So being creative is something that my mother has really instilled into each one of her children. We've all taken what we've learned from her and really turned into people that love taking risks and trying to create things. It's pretty fun. So, I KNOW that my little sister (not so little anymore, perhaps YOUNGER would be a better description... for now anyway...LOL), Jenn, is a VERY creative person. She's SUPER artistic and creates some AWESOME things. I knew that she had just moved to Colorado (from our hometown in FL) and that she was decorating/organizing the mess out of her new home. So I asked her to send me some of the neat things that she has been up to... she sent me a TON! Here's one of them... A super cute way to display your jewelry. Now, I've seen lots of different examples of this on Pinterest I guess it's just one of those preference type things. Anyhow, here's hers and how she did it! You know, as a former teacher, I realize how important reading is to kids (as most parents do as well). However, I don't know that all parents realize how easy it is to make if fun and model for kids. So, I wanted to share some reading tips with you that I've used in college, in my classroom and now, in my home to encourage reading. Click HERE and choose from 9 FREE customizable products to choose from. Just pay shipping/handling!! USE CODE: ForFree which gives you $13 credit which will give you any one of the items free. or 2 items really cheap. Today's deal is 25% off of Ornament Cards! Use code 1027DOD at checkout. Remember that the deal is ONLY good TODAY!! Today's deal is 30% off Flip Cards! Use code 1026DOD at checkout. Don't forget, this deal is good TODAY ONLY!! Y'ALL... this is one of the best recipes EVER! If you like chocolate, you will LOVE these truffles! I had my first one a year or so ago and well, I can't get enough! They're delicious AND a great idea for a teacher gift, or neighbor gift, or just for yourself. Thanks to HH reader Suzanne for sharing her recipe and pictures with us!! This is a GREAT deal! If you've never shopped at buy.com before, they have an awesome points/rewards system. THIS purchase would earn your 5,000 points = $50! GOOD STUFF!! CLICK HERE and shop the Calendars.com One Day Sale! 20% Off 2012 Calendars With Code TWENTY. CLICK HERE to save up to 20% on over 25 NEW Gift Packs! Offer vaild 10.21 through 11.22! DEFINITELY grabbing one of these for BOTH of my kids! SO excited that they're on sale!!! Ever wonder how to play the harmonica? Or how to do cool yo yo tricks? How about how to make a sushi roll? Well, Barnes and Noble is offering 40% off of Bargain Activity Kits JUST LIKE THESE and so many more! The prices start as low as $4.77!! And trust me, there are a TON! <--- This juggling set is $5.97! That could make a fun Christmas gift or even a fun gift exchange gift!!! Click here to save 25% off on trifold cards at TinyPrints. Use code 1025DOD at checkout. This deal CAN'T last forever! But, while it's still up and running, I'm going to keeping sharing it! It's a STEAL! So, if you haven't gotten your canvas yet, GRAB YOURS TODAY!!! I have been very pleased with Canvas People! GREAT gift idea for a GREAT deal!!! Click here and get it while it lasts!! Today's deal at TinyPrints is 25% off of Premium William Arthur Cards. Use code 1024DOD at checkout. REMEMBER, this offer is good TODAY ONLY!!! Click here to grab this deal! Remember that if you don't have the perfect picture yet, you can use the pre-ship service. You order your cards now and finish them with your picture later. PLUS, they'll send you your envelopes early so that you can start addressing them! Thanks SO much for HH reader, Jenny for sharing her mad DIY skills with us. You might remember Jenny, she also shared her precious bumblebee cake pops with us! She is clearly a crafty gal! Thanks again Jenny!! This week TinyPrints is having daily deals! Remember that Christmas is coming and personalized are SUPER cute!! Grab the deals while you can. **IMPORTANT** If you don't have your pictures ready (like me :-)), you can use the pre-ship service. You order your cards now and finish them with your photos later. PLUS, they'll send you your envelopes EARLY so you can start addressing them now! HOW AWESOME IS THAT?? I'll be posting the deals on their corresponding day, with links and codes... so keep an eye out for the one you like. Each sale runs for ONE DAY ONLY, don't hesitate!! Things to do THIS weekend for FREE!! THANKS to Saving My Family Money for sharing this AWESOME list of FUN FREE things to do this weekend!! AC Moore – Saturday 10/22 from 1-4pm, Halloween Costume Event, Demos: Duck Tape costumes, make & mold candy making, Snazaroo face painting. Buy a Shirt and decorate free with Simply Blood. Sunday 10/23 from 1-3pm, Demo: Caramel Apples. Babies R Us – Saturday 10/22 from Noon-3pm, Getting Comfy with Baby: From prenatal support to feeding and playtime, come learn how to make life ore comfortable for you and your little one. Sponsored by Boppy. Tuesday 10/25 at 6:30pm Gearing up for Baby Workshop: Get an introduction to all the gear you’ll need for baby. 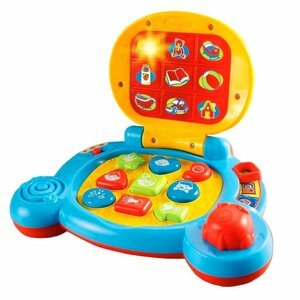 From car seats to travel systems and high chairs to play yards, plus home safety items. Sponsored by Safety 1st. Bass Pro Shops – Friday 10/21 from 4-7pm Trick or treating, from 5-7pm free Halloween reflector necklace craft, from 6-7pm Costume parade with giveaways, from 5-8pm free 4×6 photo with The Great Pumpkin Charley Brown and free coloring sheet. Saturday 10/22 & Sunday 10/23 from 11am-5pm free 4×6 photo with The Great Pumpkin Charley Brown and free coloring sheet, from 1-4pm free Peanuts trick-or-treat bag craft, at 1:30pm, 2:30pm & 4:30pm enjoy free samples of Marshmallow Roast. See store for Apple Dessert sample info. Disney Store – Friday 10/21 Session 1 – 4:30pm, Session 2 – 6:00pm and Saturday 10/22 Session 1 – 10:30 am, Session 2 – 12:00 pm: Disney Store Halloween Dress Rehearsal Party: celebrate the season early with a spook-tacular event filled with games, special viewing of Rapunzel’s coronation and a costume parade! Kids, ages 3 and up, who wear their favorite costume will receive a FREE gift! Jo-Ann Fabric & Craft Stores - Saturday 10/22 Free Demos: from 11am-1pm Aleene’s Fabric Fusion and Zipper Art Flower with Coats & Clark. 1-3pm Cricut Cake Mini Machine. 3-5pm Crafting with 3M Adhesives. Lakeshore Learning – Saturday 10/22 from 11am-3pm, Masquerade Mask: kids make and decorate a mask. Lowes Build and Grow – Saturday 10/22 from 10am-Noon, FREE: Kids build a Halloween Monster Truck! Be sure to sign up for this event here. Michaels – Saturday 10/22 from 10am-Noon, Halloween T-Shirt Event: Make a fun scary spider T-shirt with purchase of shirt. Plus, more Halloween events all week long! Michaels Jewelry Events (Adults only) – Sunday 10/23 from 1-2pm, Trinkettes Event: Make-It Take-It with purchase of pendant (see Coupons here). From 2-2:30pm, Stretch Magic Bracelet Demo. From 2:30-3pm, Good to Be Queen Bracelet Demo. From 3-4pm, Make-It Take-It Memory Wire Bracelet Event. Pottery Barn Kids – Tuesday 10/25 at 11am, Halloween Story Time: Kids can dress up and enjoy spooky stories, sticker giveaways and more. Toys R Us - Saturday 10/22 from 11am-1pm, Sesame Street Event: Sing & Dance with the New Let’s Rock Elmo. From 2-4pm, Beyblade Tournament: It’s the Last Beyblade Battle Event of the Year. Thanks to HH reader Jill for sharing this AWESOME DIY project with us!! "I couldn't find exactly the pendant light that I wanted and if I saw one close to my idea, it was crazy expensive. So, after a couple of weeks of just the fixture hanging with bulbs, it hit me, I would HAVE to build my own" This is what lead HH reader Jill to take on this well worth it DIY project!! Shoe Carnival Surprise Savings Get up to an Extra $15.00 off! Our best coupon offer is in-store and online. It’s never been more exciting to save. We’re surprising you with unbelievable savings on our already heart-stopping selection of the hottest styles. And, for the first time ever, you can save two different ways: in-store or online. You can simply print the coupon and bring it with you to your Shoe Carnival Store. There you’ll find out whether you’ll get an additional $5, $10 or $15 off your purchase of $39.98 or more on top of great sale prices. Or, shop online at shoecarnival.com. Once your total reaches $39.98, the Surprise Savings will be automatically applied at checkout. So, go ahead and check out some of our shoes below. Happy shopping. CLICK HERE and GET SHOPPING!!!! Offer expires 10/25/11. Boot Sale! Take 15% off any boot at UmiShoes.com with code LSBOOT15 plus get free shipping! Valid 10.17-10.31. Click here to browse the boots!! So, the other day at the gym, I was reading a magazine on the elliptical (anything to keep my mind off what I was doing- it actually did work). I came across this super cute idea and thought I'd share it with you since there's a FREEBIE DEAL right now on it!! YAHOO!! You can find out what coupons are coming in this week's paper! Click here to check it out and start planning ahead for all of your savings TODAY! *Just so you know, there is a link on the right hand side of this page that is always there if you ever want to check out the inserts that will be coming in the future! On-Line Shoppers... CHECK THIS OUT! Are you someone that shops online and is always digging through your emails to find shopping receipts to make returns or shipment confirmations to see when packages will arrive? Do you ever make purchases and think maybe I should have waited until this item went on sale? 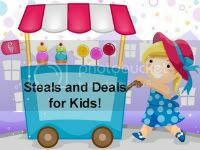 If so, ShopSanity has come out with a great new tool that will make shopping easier - and guess what moms… it’s FREE and the sign could not be easier (just 2 clicks)! Sign up for ShopSanity.com now to: -See all of your purchases in one location so you can: -See when a package will arrive -Lookup details about any purchase -Print a receipt for a return -Save money by receiving alerts such as price changes (notifies you when purchases you have made go on sale so you can contact the retailer about getting cash back), shipment changes (including backorders and delays) -And much more! Click here and get started now! I'm sure that PLENTY of you have had these delicious cookies. BUT, just in case you haven't I thought I would post the recipe. These cookies are a staple in our family. When my husband is deployed, these are one of his FAVORITE snacks to get. They travel well, and because they're just 'plopped' on the wax paper, it doesn't matter if they change their shape at all. And just like their name implies, there is NO BAKING involved. Seriously, the kind of cookie that you can have on the cooling rack in 15 mins or so (the entire batch cooling... not just one cookie sheet full). I often just whip them up if I need to bring a sweet treat or snack somewhere. Most of the ingredients are things that you have just lying around. So, this offer is more than just what it seems. If you are someone who likes deals... which, I AM! Here's a secret to this awesome deal! So sure, you get a FREE chips & queso (which don't get me wrong, is no small thing). BUT, when you sign up for their newsletter, you get OTHER hot deals too! For instance, last week they sent out a FREE DESSERT COUPON... ok, where are my dessert loving people?! ME ME ME!!!! Anyhow, click here and hop onto their mailing list, and enjoy a FREE CHIPS & QUESO too!! So, if you haven't grabbed yours yet, or can't come up with ideas... I thought I'd show you an idea of something you can do with this AWESOME deal! This is the top of the playroom wall. CanvasPeople send LOTS of great discounts, but this deal is FANTASTIC! Click here to go get your canvas today!! A GREAT way to gear up for the weather changes that are happening is through SALES and DISCOUNTS! CHECK THIS ONE OUT!! Get $20 off purchases of $100 or more at JessicaSimpsonCollection.com. Enter Code JSCOCT. Valid through 10/31/11. Here's another GREAT deal for the holidays. It won't be here for long. So be sure to check it out!! Get Ready for the Holidays!! Up to 30% Off Barbie, Little Tikes, Webkinz, and More at Barnes&Noble.com! 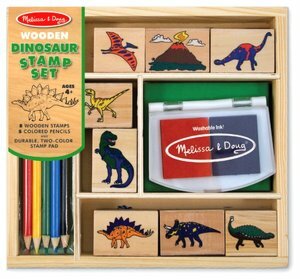 Melissa & Doug dinosaur stamp set $6.96! !